Though the majority of the MTG community seems to be in an uproar about the amount of value placed in Modern Masters 2015, profit can still be accumulated. As with many sets, cracking cardboard lottery tickets to push out those last few proxies in your Modern deck is not a road worth traveling. In fact, I wouldn’t take a road at all. I want to sit in a lawn chair off the beaten path with sunscreen on my nose and wait for the tidal wave of Modern Masters 2015 singles to wreck the complacent prices that have become accepted as part of a Modern player’s life. Normally, a Financial Five article will cover five new cards from an upcoming release I deem to possess profitable potential. Since Modern Masters 2015 contains 100% reprints, we already know many of the roles it plays or decks lists play four copies. …reprints bring prices down (unless you’re Tarmogoyf). …format staple prices will recover over time (proven by the first Modern Masters). …Modern will never be as cheap as you want it to be. So this time on Financial Five, we’re going to discuss five cards worth picking up at the bottom of their financial decent that also have the most potential to recover over time. 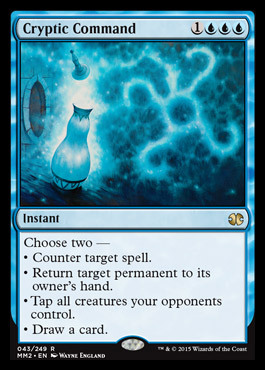 From four copies in the UWR Control deck down to a double copy in Splinter Twin variants, it’s the Swiss army knife every blue player loves and everyone else hates. The top shelf $60 price tag was simply out of reach for anyone wanting to dip their toes into Modern with being forced to play the handful of budget aggro decks. During the early months of 2014 (six months after the Modern Master release) Cryptic sat at an understandable $25. I think the 2015 print will bring it back to that desirable price and slowly start to creep back up as early as the Origins release. Pick up $25 or under. 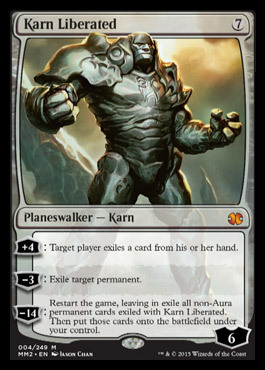 Starting at $50, Karn has already taken a couple steps down but I don’t think he’s done yet. Though he honestly only sees competitive play in TRON variants, I think Commander players will have a large influence on recovering his price. Though the recovery will be slower than Modern staples, like Cryptic Command or Noble Hierarch, I think he will land $25 or under and creep up in the long run. Pick up $25 or under. Love it, hate it, or still want it banned, we have to respect the power of Splinter Twin. Over the last year this card alone has spawned so many variants you’d have to go to college to count that high. It’s the definition of a format staple and a worthy reprint. Twin’s price wasn’t out of control yet but was clearly teetering on the edge. I expect the bottom price to land around $10 and stay close to it for the next year. Pick up $10 or under. This little 0/4 has been the chief of Splinter Twin’s security detail for close to three years. It’s won over a slot in Modern and Legacy Infect lists and, more importantly, can take a bolt. Though Spellskite’s price has been increasing faster than Meandering Towershell, I still feel a $10 price tag should be the lowest it will go before heading back up. Pick up $25 $10 or under and your future sideboards will thank you. Let’s be honest, this price was getting WAY out of hand. I doubt Modern Masters 2015 will drop Noble low enough to satisfy every Modern player, but she sees too much competitive play to fall into a $10 range. I honestly feel $30 will be a reasonable price to go in at. You could get greedy and wait for a lower bottom but it won’t take long for the price to ascend quickly after hitting the bottom. Its existence in Infect, Zoo, and a variety of Junk (Abzan) decks will welcome all those looking to investing in Modern therefore keeping her demand high. 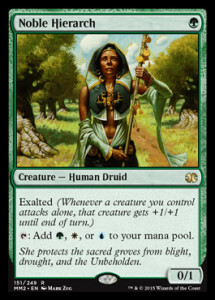 If supply can’t keep up with all the new Modern players she might be back at $50 before you know it. Pick up $30 or under. I’m excited for the Modern Masters 2015 Limited format but don’t feel popping open $10 lottery tickets have enough to reward me financially. I think attacking trade binders and single cases is the best way to unlock those decks you have been wanting to pilot. I’m still thankful for the Modern Masters series Wizards of the Coast is printing though. Las Vegas weekend is going to be one for the record books. If you’re attending Grand Prix Las Vegas and want to meet, hit me up on Twitter. Thank you Carlos! I’m definatly no the man for MODO but I’m sure many MODO financiers like MarcelMTG would be qualified for such content. Another card I think should be picked up is Vendilion Clique. coming off a ridiculously high price of $70+ and a current mm15 preorder of $50.15 TCG mid. This is a card that sees play in a lot of legacy and twin in modern. Being printed in morning tide (feb 2008) there would have to be about as many copies out there as tarmogoyf (April 2007), with printings in step and at the same rarity since then. The exception is a judge promo. Where clique falls down is modern demand – there is only one tier 1 deck that that truly wants this, and it is not as a 4 of. That being said, if faeries ever comes back (which is possible with a possible return to tribal in battle for zendikar) this is the type of card that could demand prices not too much below the goyf. If there is a chance you are going to play this card, getting in at under $40 for 2 or 3 copies seems the go to me. UWR Midrange plays clique and that’s a deck that definitely top 8s from time to time. Thanks for the heads up Josh. This error was my fault. The pollen here in East TN was relentless toward my allergies this past weekend. Not my best word configuration at all. Travis Allen did a wonderful job tweeking the article to a readable status. I agree with you about Vendilion Clique 100%. It was on my list for cards to feature in the article but I ended up ranking it #6 mainly due to its similarities to Cryptic Command. I felt it would recover at the same pace but Cryptic would be in more deck lists, with more copies, and have a chance to fall farther due to the rarity difference. The tribal faeries in Zendikar is not a speculation I had considered. Defiantly a high risk / high reward investment but possibly one you can brush your shoulders off about in the future. Under $40 seems like a safe but accurate pick up price. Spot on article, very much in line with what I discussed in my article yesterday. Great minds think alike – acquire key Modern staples when they sell off due to reprinting. Indeed! Players at my store have all been asking what/if/when they should sell and what/if/when they should buy to get into Modern. I think the demand in Modern will skyrocket once again with this sets release plus the 3 record breaking GP’s hosting Sealed tournaments on opening weekend will unlock some windows to buy in at rock bottom. When multiply writers are publishing similar advice without previous conversations with each other, you know they are probably onto something. Thanks for the feedback Sigmund. It means a lot. My pleasure! Enjoy the discussion. There are really many unknowns here when it comes to MM2015’s influence on pricing. I’m going to be watching trends VERY closely. This set is the set that has made me quit this game, WotC has brought the game back to the rich people a regular person cannot afford this game anymore. What would be your target price to buy into foil Splinter Twin? If the regular version gets down to 10$, would the foil fall to 20$ keeping the current 2x ratio? @Nathan: Not sure I get your point, this set is all about reprints wich are keeping the prices down.